Nigel Slater in The Observer today has recipes for wild garlic, nettles and dandelions. His roast lamb with wild garlic butter sounds particularly delicious! 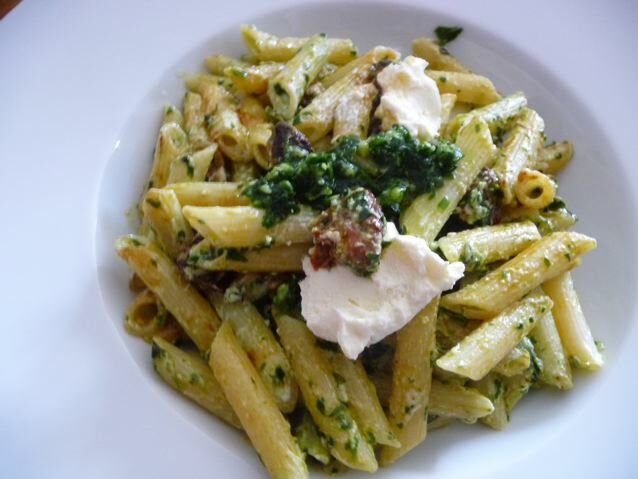 But it might have to wait till another time…..
…..for a quick lunch today, wild garlic pesto, yoghurt (labneh) cheese, grilled chorizo, penne pasta all on the table in twenty minutes. Not quite pot noodle but almost as quick! This entry was posted in Plants and Trees and tagged Bread, nigel slater, the observer, wild garlic on 02/05/2010 by Joanna. Wow, what was it like? Wow, that really looks tasty! I wonder if that is the same thing that we call wild onion grass. To me, it always smelled more like garlic than onions. Two years ago, but this time of year, I was camping by a river bank in a huge patch of this stuff; on a whim, I chopped some of the tops like chives and added it to the morning eggs. The puppies and I loved it! Ooh – fast food at it’s best – this looks so scrumilious. Very interested now in Ulrike’s dandelion ice-cream. Looks good, thanks for the link Ulrike! Wild garlic pesto!! I would adore that – I’m hooked on the pesto we make from garlic shoots! I love cooking with garlic shoots too but our garlic is about six months off! Do you grow rocket (arugula) Celia? That makes a mean pesto too! I have to get some sown this week. I wonder if yours is different from ours, the stuff I grow in the garden is light and peppery when young, though it does get bitter if it gets too old ?